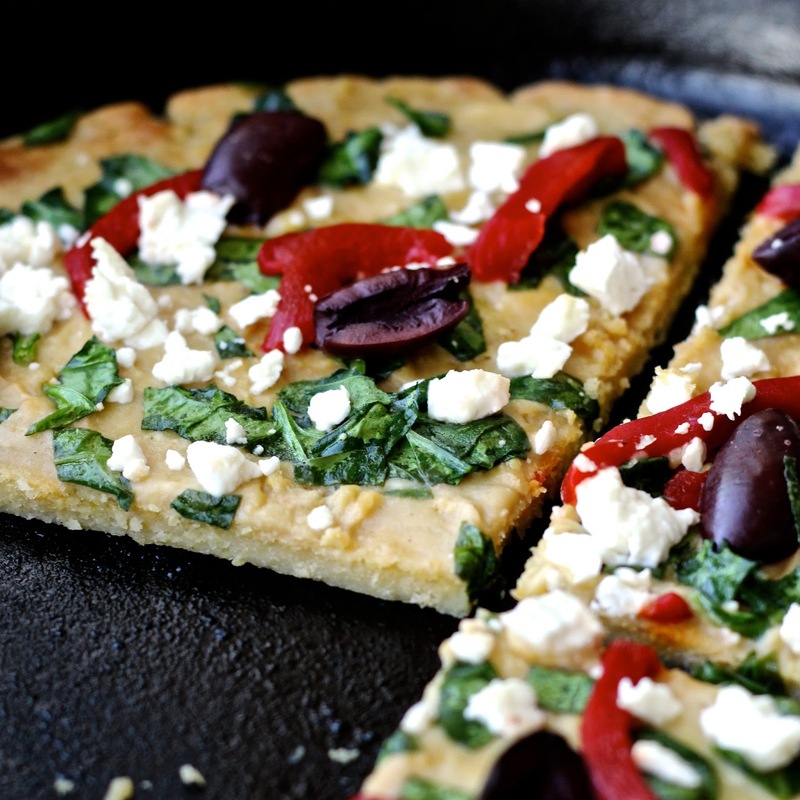 Turn up the flavor at your next tailgating party with this Mediterranean-inspired pizza dish made with hummus and a simple chickpea crust. your bean recommendation for the week! Pizza is a traditional tailgating dish but can often be loaded with calories and fat depending on the amounts of cheese and toppings on it. So I set out to make a healthier, more nutritious version of pizza using Sabra hummus. Since hummus is made from chickpeas, I thought a homemade socca would be the perfect crust to highlight the hummus. What’s a socca, you ask? Socca, also called farinata, is a thin chickpea pancake that hails from France. It’s a simple dish, made by mixing chickpea flour with water, oil and salt. It’s then cooked in the oven, traditionally in a copper pan, but a cast iron skillet works great. It’s typically served with a sprinkling of olive oil, salt, pepper and herbs before being cut roughly into pieces. Socca has a slightly nutty flavor from the chickpeas and the edges get nice and crispy from its time under the broiler. It’s also gluten free. also be called garbanzo bean flour. If you can’t find chickpea flour, the good news is that you can make it by grinding up dried chickpeas in your blender. That’s actually what I did because my local grocery store was out of chickpea flour. It was really easy and took just a few seconds in my Vitamix. My Mediterranean Socca Pizza is cooked in the oven until golden brown and crispy and then topped with delicious Mediterranean ingredients. Instead of tomato sauce, I spread a layer of Sabra Roasted Garlic Hummus on the crust and then top it with fresh, flavorful ingredients- baby spinach, roasted red peppers, kalamata olives and feta cheese- yum! Of course, you can use whatever ingredients you like but this combination was perfect! Cut it into slices or rough wedges and serve. It can be made ahead and reheated or served at room temperature. Pick it up with your hands, no utensils necessary. It’s the perfect game day dish for feeding a crowd. 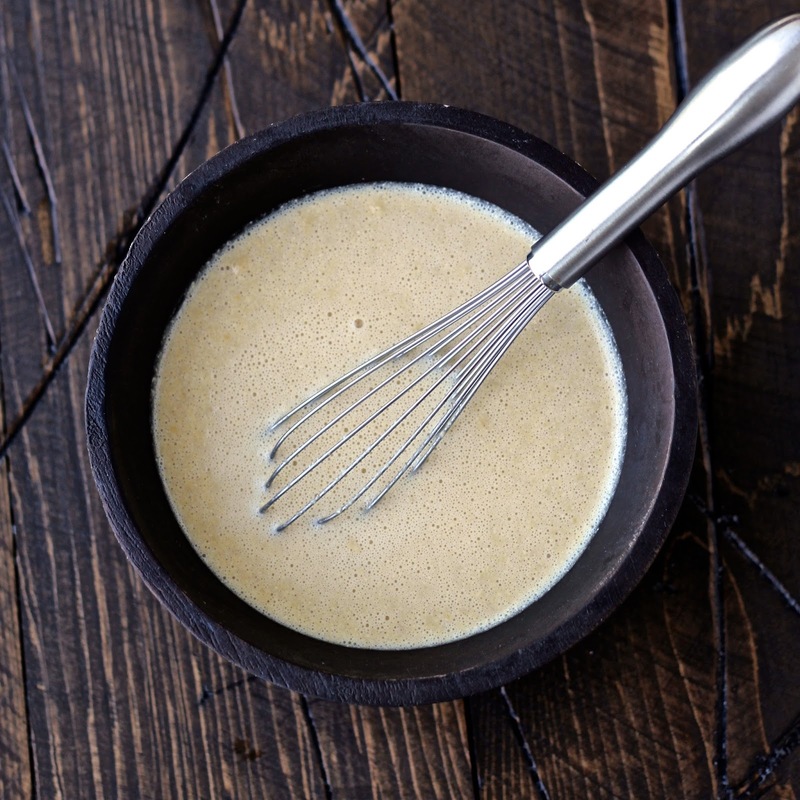 Whisk the chickpea flour, water, salt and 1 ½ tablespoons oil together in a medium bowl. Let the batter rest at least half an hour at room temperature to give the flour time to absorb the water. Position an oven rack 6-8 inches under the broiler and turn on your oven’s broiler. Pour 1 tablespoon oil into a 10-inch cast iron or other oven-safe skillet and swirl to coat the bottom of the pan. Place the skillet in the oven for a few minutes to heat up. Carefully remove the skillet from the oven with oven mitts and pour the batter into the hot skillet. Tilt the pan to spread the batter evenly over the surface. Place the skillet under the broiler and cook 5-8 minutes, until the socca is set and the edges start to brown. Carefully remove the skillet from the oven. Spread the hummus evenly over the surface of the socca with a spatula, leaving a ½-inch border. Toss the spinach with ½ teaspoon olive oil to coat the leaves. 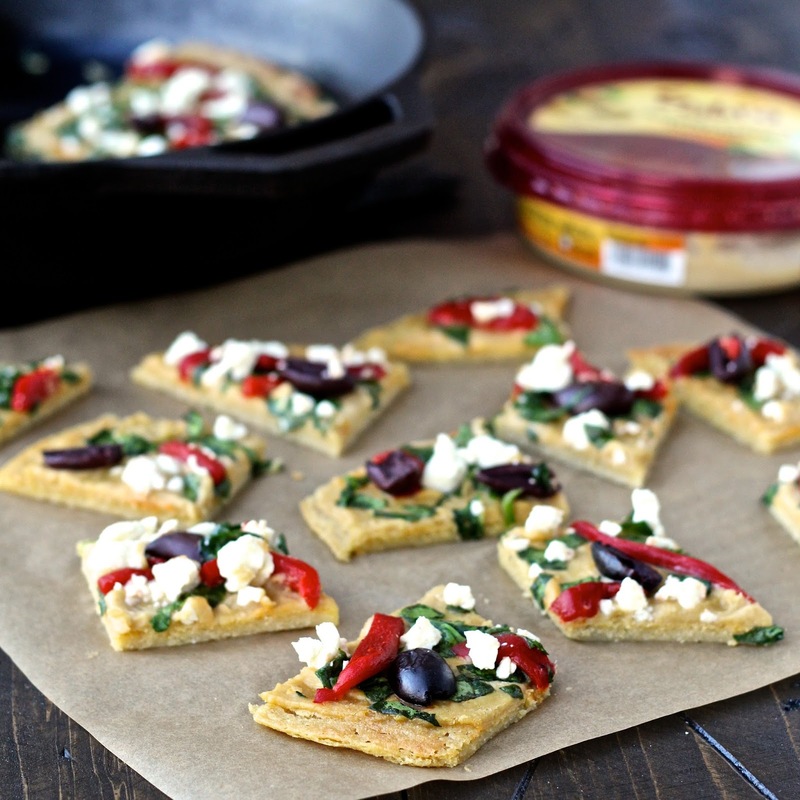 Scatter the spinach, roasted red peppers, olives and feta cheese on top of the hummus. Return the skillet to the oven and broil for 3-4 minutes until the ingredients are heated through. Remove the skillet from the oven and let cool for a couple of minutes. Then cut socca into slices or wedges and serve. For more information about the health benefits of Sabra hummus, CLICK HERE. Check out these links to see the delicious tailgating dishes my fellow Recipe Reduxers are making with hummus! I adore making socca pizza, so easy and delicious! Yay, a fellow socca fan. Thanks Cara! I can't get over how much we think alike! i swear i was going to make farinata as a base for my flatbread too! Yours looks absolutely delicious and the photos are gorgeous! good luck with the contest! Now this is my kind of tailgating pizza! I fell in love with socca for the first time last year and I couldn't get enough! This is the perfect party dish. YUM. Thanks so much Alanna! Isn't socca wonderful? I'm crazy about socca, but have never made it. This is giving me a little kick in the pants to try it. Beautiful! Thanks Katie! I hope you make it and love it! 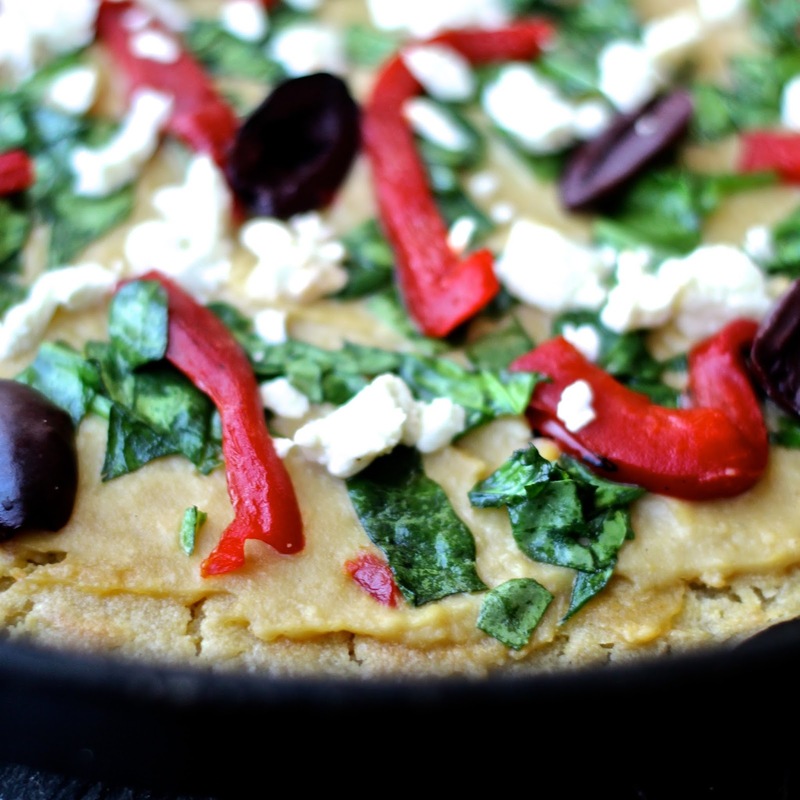 Sonali – I've never had socca before – but loving the fact that it's made with chickpea flour – and paired with a chickpea topping! So delicious and healthier, and more nutritious too! Thanks Shashi! You would love socca, it's definitely right up your alley! This looks so delicious! I'm so glad I stumbled upon your blog today. I'm so glad you did too! Thanks Dani!